Rate this project Kali Linux is a Debian-based distribution which features several security and forensics tools. The project has adopted a rolling release approach to new versions. The new release, Kali Linux 2017.1, features drivers for RTL8812AU wireless chipsets, improved GPU support and there are now Azure and AWS images of Kali Linux for cloud instances. "Finally, it's here! We're happy to announce the availability of the Kali Linux 2017.1 rolling release, which brings with it a bunch of exciting updates and features. As with all new releases, you have the common denominator of updated packages, an updated kernel that provides more and better hardware support, as well as a slew of updated tools - but this release has a few more surprises up its sleeve. A while back, we received a feature request asking for the inclusion of drivers for RTL8812AU wireless chipsets. These drivers are not part of the standard Linux kernel, and have been modified to allow for injection. Why is this a big deal? This chipset supports 802.11 AC, making this one of the first drivers to bring injection-related wireless attacks to this standard." A summary of available features in version 2017.1 can be found in the project's release announcement. Download (SHA256): kali-linux-2017.1-amd64.iso (2,664MB, torrent, pkglist). Kali Linux is a Debian-based distribution with a collection of security and forensics tools. The project's first release of 2019 offers wider support for ARM devices and an updated version of Metasploit: "Welcome to our first release of 2019, Kali Linux 2019.1, which is available for immediate download. This release brings our kernel up to version 4.19.13, fixes numerous bugs, and includes many updated packages. The big marquee update of this release is the update of Metasploit to version 5.0, which is their first major release since version 4.0 came out in 2011. Metasploit 5.0 is a massive update that includes database and automation APIs, new evasion capabilities, and usability improvements throughout. Check out their in-progress release notes to learn about all the new goodness. Kali Linux 2019.1 also includes updated packages for theHarvester, DBeaver, and more. For the complete list of updates, fixes, and additions, please refer to the Kali bug tracker changelog." Additional information can be found in the project's release announcement. Download (SHA256) (pkglist): kali-linux-2019.1-amd64.iso (3,268MB, torrent), kali-linux-light-2019.1-amd64.iso (931MB, torrent). Kali Linux is a Debian-based distribution with a collection of security and forensics tools. The project's latest release is Kali Linux 2018.4 which includes one significant new tool and an experimental 64-bit build for Raspberry Pi computers: "Welcome to our fourth and final release of 2018, Kali Linux 2018.4, which is available for immediate download. This release brings our kernel up to version 4.18.10, fixes numerous bugs, includes many updated packages, and a very experimental 64-bit Raspberry Pi 3 image. We have only added one new tool to the distribution in this release cycle but it’s a great one. Wireguard is a powerful and easy to configure VPN solution that eliminates many of the headaches one typically encounters setting up VPNs. Check out our Wireguard post for more details on this great addition. Kali Linux 2018.4 also includes updated packages for Burp Suite, Patator, Gobuster, Binwalk, Faraday, Fern-Wifi-Cracker, RSMangler, theHarvester, wpscan and more. We have also created a very experimental Raspberry Pi 3 image that supports 64-bit mode." Further information can be found in the project's release announcement. Download (SHA256, pkglist): kali-linux-2018.4-amd64.iso (2,994MB, torrent), kali-linux-light-2018.4-amd64.iso (867MB, torrent). Kali Linux is a Debian-based distribution with a collection of security, penetration testing and forensics tools. The project's latest release is Kali Linux 2018.2, which includes kernel updates and fixes for the Meltdown and Spectre CPU bugs. "This Kali release is the first to include the Linux 4.15 kernel, which includes the x86 and x64 fixes for the much-hyped Spectre and Meltdown vulnerabilities. It also includes much better support for AMD GPUs and support for AMD Secure Encrypted Virtualization, which allows for encrypting virtual machine memory such that even the hypervisor can't access it. If you spend any significant amount of time writing exploits, you are undoubtedly familiar with the various Metasploit scripts that are available. 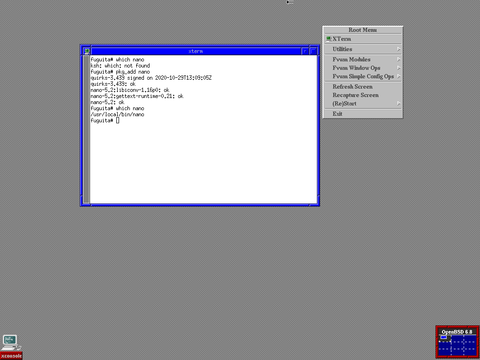 You are likely also aware that all of these helpful scripts are tucked away and a little difficult to make use of. Fortunately, as of Metasploit Framework 4.16.34, you can now make use of all these scripts directly as we have included links to all of them in the PATH, each of them pre-pended with msf-." There have also been updates to the Bloodhound, Reaver, PixieWPS, Burp Suite and Hashcat packages. Further details can be found in the project's release announcement and in the Change Log. Download (SHA256) (pkglist): kali-linux-2018.2-amd64.iso (2,800MB, torrent), kali-linux-light-2018.2-amd64.iso (865MB, torrent). Kali Linux is a Debian-based distribution that includes a collection of security and forensics tools. 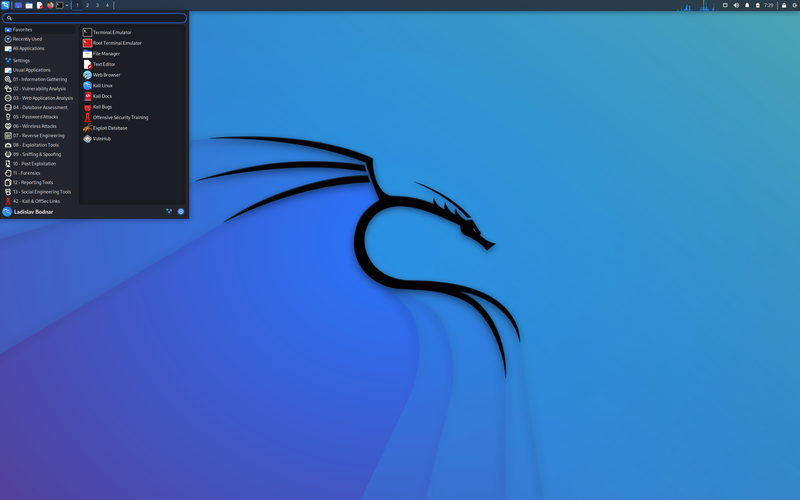 The Kali developers have released a new version, Kali Linux 2018.1, which features an updated kernel and two new security features: "Kali Linux 2018.1 has a shiny new 4.14.12 kernel. New kernels always have a lot of new features and the 4.14 kernel is no exception, although two new features really stand out. AMD Secure Memory Encryption Support - Secure Memory Encryption is a feature that will be in newer AMD processors that enables automatic encryption and decryption of DRAM. The addition of this features means that systems will no longer (in theory) be vulnerable to cold-boot attacks because, even with physical access, the memory will be not be readable. Increased Memory Limits - Current (and older) 64-bit processors have a limit of 64 TB of physical address space and 256 TB of virtual address space (VAS), which was sufficient for more than a decade but with some server hardware shipping with 64 TB of memory, the limits have been reached. Fortunately, upcoming processors will enable 5-level paging, support for which is included in the 4.14 kernel." More details can be found in the project's release announcement. Download (SHA256, pkglist): kali-linux-2018.1-amd64.iso (2,888MB, torrent), kali-linux-light-2018.1-amd64.iso (846MB, torrent). Kali Linux 2017.3 has been released. Kali Linux, maintained and funded by Offensive Security Ltd, is a Debian-derived Linux distribution designed for digital forensics and penetration testing. This version delivers an updated kernel and a number of new tools: "We are pleased to announce the immediate availability of Kali Linux 2017.3, which includes all patches, fixes, updates and improvements since our last release. In this release, the kernel has been updated to 4.13.10 and it includes some notable improvements: CIFS now uses SMB 3.0 by default; ext4 directories can now contain 2 billion entries instead of the old 10 million limit; TLS support is now built into the kernel itself. In addition to the new kernel and all of the updates and fixes we pull from Debian, we have also updated our packages for Reaver, PixieWPS, Burp Suite, Cuckoo...." Read the full release announcement for further details and screenshots. Kali Linux 2017.3 is available in several editions depending on your preferred graphical interface; download (SHA256, pkglist) links: kali-linux-2017.3-amd64.iso (2,753MB, torrent), kali-linux-light-2017.3-amd64.iso (823MB, torrent), kali-linux-e17-2017.3-amd64.iso (2,510MB, torrent), kali-linux-mate-2017.3-amd64.iso (2,652MB, torrent), kali-linux-xfce-2017.3-amd64.iso (2,540MB, torrent), kali-linux-lxde-2017.3-amd64.iso (2,558MB, torrent). Kali Linux is a Debian-based distribution with a collection of security and forensics tools. The project's latest version, Kali Linux 2017.2, introduces a number of new security and penetration tools, as well as package updates from Debian's Testing branch. "In addition to all of the standard security and package updates that come to us via Debian Testing, we have also added more than a dozen new tools to the repositories, a few of which are listed below. There are some really nice additions so we encourage you to 'apt install' the ones that pique your interest and check them out. hurl - a useful little hexadecimal and URL encoder/decoder; phishery - phishery lets you inject SSL-enabled basic auth phishing URLs into a .docx Word document; ssh-audit - an SSH server auditor that checks for encryption types, banners, compression, and more; apt2 - an Automated Penetration Testing Toolkit that runs its own scans or imports results from various scanners, and takes action on them...." A complete list of new utilities and their functions can be found in the project's release announcement. Download (SHA256, pkglist): kali-linux-2017.2-amd64.iso (2,880MB, torrent), kali-linux-light-2017.2-amd64.iso (858MB). Kali Linux is a Debian Testing-based distribution which includes many forensic and data recovery tools. The distribution uses a rolling release model for updates with Kali Linux 2016.2 providing the most recent snapshot of packages. "During these past few months, we've been busy adding new relevant tools to Kali as well as fixing various bugs and implementing OS enhancements. For example, something as simple as adding HTTPS support in Busybox now allows us to preseed Kali installations securely over SSL. This is a quick and cool feature to speed up your installations and make them (almost) unattended, even if you don't have a custom built ISO. To set a preseed file during an install process, choose the 'install' option, then hit Tab and enter the preseed directive, together with a URL pointing to your actual preseed file." Additional details on the 2016.2 snapshot of Kali Linux can be found in the project's release announcement. Download (SHA1): kali-linux-2016.2-amd64.iso (2,934MB, pkglist). Kali Linux is a Debian-based distribution that ships with a collection of security and forensics utilities. The distribution recently shifted from issuing fixed releases to a rolling release model. The project has announced the launch of Kali Linux 2016.1, the first version of the distribution's new rolling release series. "Today marks an important milestone for us with the first public release of our Kali Linux rolling distribution. Kali switched to a rolling release model back when we hit version 2.0 (codename `sana'), however the rolling release was only available via an upgrade from 2.0 to kali-rolling for a select brave group. After five months of testing our rolling distribution (and its supporting infrastructure), we're confident in its reliability - giving our users the best of all worlds - the stability of Debian, together with the latest versions of the many outstanding penetration testing tools created and shared by the information security community." Additional information and screen shots are available in the project's release announcement. Downloads (SHA1): kali-linux-2016.1-amd64.iso (2,809MB, torrent, pkglist).